In this newsletter edition we like to inform you about the outcome of the #next_photonics.forum 2018 and how we will proceed with the further strategy process towards a new Photonics Multiannual Roadmap. 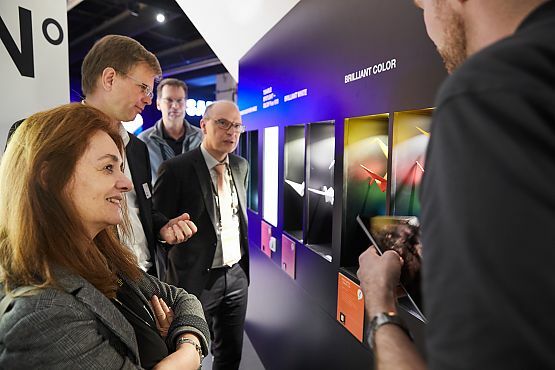 Read more about the visits from Commissioner Carlos Moedas to DAS Photonics in Barcelona and Lucilla Siolis visit to the Light & Building fair in Frankfurt. Spread the word about the #next_photonics.Prototype your idea contest. Applications are open! Discover the newly published Photonics PPP Activity report and read what the Photonics PPP has achieved in the last year. We also like to update you on some upcoming photonics conferences and news for the European photonics community. 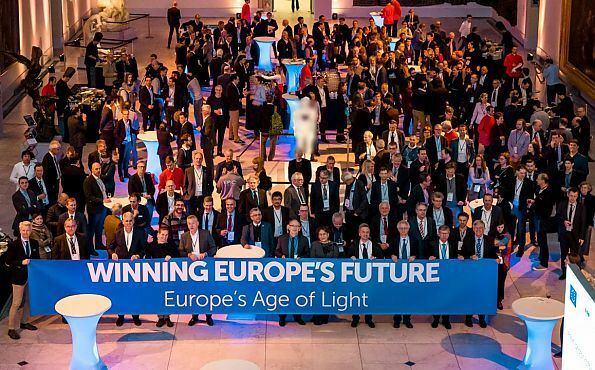 The European Commission's new Director of Digital Industry, DG Connect, Lucilla Sioli, paid homage to the Photonics PPP at this year's Annual Meeting entitled 'Winning the Future – Europe's Age of Light'. 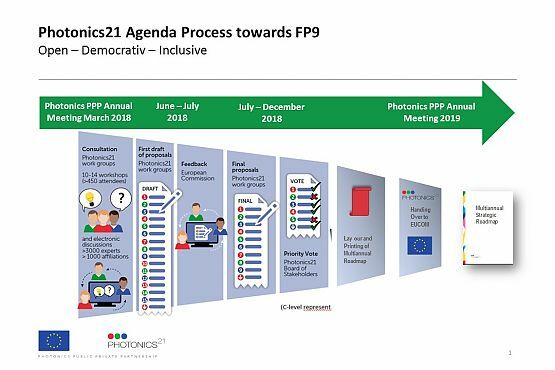 Run by the Photonics21 community as an open innovation platform, the PPP was described by Sioli as being "one of the best and most efficient contractual PPP's we have ever seen in the Commission" in her Our Way Towards FP9 speech. The annual gathering set about defining the challenges that lie ahead in Research & Innovation for photonics and its applied fields. The photonics strategy process which was kicked-off alongside the Photonics PPP Annual Meeting 2018 in Brussels will be continued within the next months. You can see the overview on the further process above. Depending on the progess of each work group during the first workshop in Brussels there will take place a follow-up workshop within the next months. The next Photonics21 work group 3 workshop "Life Sciences and Health" has been scheduled on 5th July 2018 and will take place in Berlin. Any further details on the follow-up workshop as well as information on the registration will be provided within the next weeks. We will inform you as soon as any further workshops have been scheduled. In the further process an editor team of each work group will then draft a first thematic chapter for the new multiannual roadmap which will be circulated to all work group member for further feedback and comments. The final thematic chapter will then be provided again to all work group members as well as to the Board of Stakeholders as main decision making body of Photonics21. Once the photonics roadmap is final it will be handed over to the Europan Comission at the Photonics PPP Annual Meeting 2019 as input to the new framework programme. Great recognition for photonics and the Photonics PPP through the visit of Commissioner Carlos Moedas to our Board member DAS Photonics in March. The Commissioner was "delighted to meet researchers working on H2020 projects. 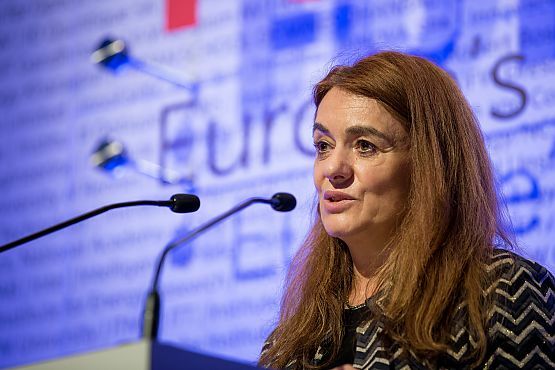 Europe needs breakthrough innovators to boost its leadership in research and innovation!" It is also worth to watch the video from his visit (in Spanish). Our President Aldo Kamper was showing Lucilla Sioli, Director Digital Industry (DG Connect) and Werner Steinhögl, Head of Photonics sector from the European Commission around at the Light & Building fair in Frankfurt to show photonics innovations on smart cities, horticulture lighting and lighting design. Photonics21 Vice President Jaap Lombaers presented the activities and progress of the Photonics Public Private Partnership at the European Commission ICT Committee meeting and gave hands on examples of photonics innovations. Member states provided positive feedback on the progress of the PPP and the way it is organized and decisions are taken in an open and transparent way. Photonics21 informed about the progress and success of the Horizon2020 Photonics Public Private Partnership at the OECD workshop "Boosting knowledge transfer between science and industry: New models and business practices" which was coorganized with FRANCE STRATEGIE in Paris on the 14th March 2018. Next to recent success stories a special focus was laid on the way the Photonics PPP is organized as an open innovation platform involving industry and academia alike to work on a common strategic roadmap. "Prototype your idea" is a competition for business ideas in an early stage. It is a prototypical startup competition. It can be a simple thought, an idea you cannot get out of your head or an idea that you have been working with for a while. Any further details are published on the Photonics21 website. Chronic skin conditions such as Actinic Keratosis, acne, and psoriasis can now be treated in a single 150-minute appointment, thanks to a new wearable laser that blasts the skin with light. 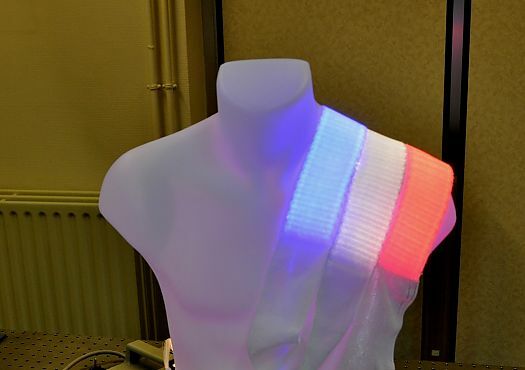 French scientists at 'Texinov Medical Textiles', have developed a knitted laser fabric that blasts the skin with light, giving treatment to enflamed skin or lesions over a 2-and-a-half-hour appointment. The Photonics21 Annual Activity Report is now open for public. Find out more about the activities of Photonics21 and the Photonics PPP during 2017. The report is ready for download in the download area of our website. The European project PoLaRoll which is funded under Factories of the Future aims to integrate, for the first time, high speed ultra-short pulse laser ablation process into a roll-to-roll machine fulfilling the requirements of individualised laser-based mass production. To reach this ambitious goal, various technological and scientific disciplines will be brought together in the PoLaRoll project. The latest newsletter of the project has now been published on the PoLaroll project website. Present your research at the only European cross-disciplinary optics and photonics event covering the most significant photonics technologies—from digital optics to quantum technologies to attosecond science. Look for new topics in 2018, including 3D printed optics, photonic glasses, optical biopolymers, and unconventional optical imaging. The 2018 call for papers is now open. Alongside the conference an industry exhibition will present latest products and developments. We will be represented alongside the exhibition – come and visit us at booth number B514 in the exhibition area. OPTICS 2018, the International Conference on Optical Communication Systems, will bring together researchers, engineers and practitioners interested on any of the optical communication components of an optical communication system, or the system itself.